Dental bonding is a cosmetic dental procedure that can improve the look of your teeth, and give you a more attractive smile. It’s a fast and relatively inexpensive way to improve the look of teeth that are chipped, broken, cracked, stained, or have excess space between them. Bonding can also be used to protect exposed roots, or to fill small cavities. One of the best things about dental bonding is that for the most part, it can be applied in a single office visit. So, is dental bonding the right solution for you? Can it give you the smile you really want? Read on and find out what you need to know about this cosmetic dental procedure. What Exactly Is Dental Bonding? In this procedure a composite resin material is applied to the surface of your teeth. While it is in general a cosmetic procedure, it can be of benefit to your overall oral health. 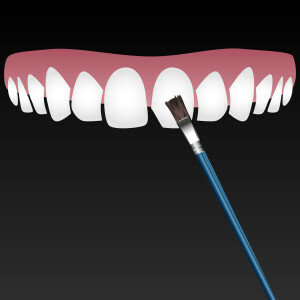 The resin material is carefully made to match the shade of your existing teeth before it is used. As one would do with a dental veneer procedure, you may have your teeth whitened first, and then have the dental bonding done to compliment your newly whiter smile. Dental bonding and dental veneers will produce very similar results in most cases. The difference lies primarily in the cost. Tooth by tooth, dental bonding is the less expensive option. It also does not require as much alteration of the structure of the teeth. Dental bonding is stronger and more durable, but, unlike veneers, it will not allow some light to pass through its surface, like the natural enamel of your teeth. So dental bonding will give you a more natural look. Am I A Good Candidate For Dental Bonding? Do you have minor dental flaws that affect your front teeth? Are your gums and your teeth in general good health? Are you a smoker? If you answered yes to the first two, and no to the third, you are a good candidate for it. If you have any cavities or gum disease, these are problems that need to be resolved before you undergo the process. If you do not already know, smoking is the most common cause of discoloration in your teeth. For this reason, dentists, including Our Providers, will recommend that you stop smoking before and immediately following any dental bonding procedure. This treatment can cost anywhere from $100 to $400 per tooth. There are a number of variables that determine the exact cost. The first is the number of teeth you need to have bonded. The area that you need treatment for is also another variable. For example, if you just need a single chipped tooth filled in, the cost will in general be less than the cost for having an entire discolored tooth treated. The more teeth you need bonded, the more it is going to cost you, as you might expect. The area in which you live is another variable that will affect the cost of dental procedure. You can expect the cost to be higher in large cities than in most rural areas. Do you know that dental bonding procedures are covered by most insurance policies? Check with your insurance benefits manager to ensure that you are covered. Do put some thought and research into choosing a dentist for your procedure. You are making an investment in your smile, and in your future, and you want the best possible results. Do not choose the cheapest dentist without first researching – choose a dentist that has a proven track record, and years of experience. Taking this approach is most likely to yield the best results. Want To Learn More About Dental Bonding? Snellville Family Dental, works in tandem with the staff of experienced and professional group of dental lab technicians to create natural looking results with all of our dental restoration and cosmetic procedures. Your teeth after the dental bonding procedure will look, feel, and function like the rest of your teeth, and they will just look just like the rest of your teeth. This is also a cost-effective procedure, that will not break your bank account. If you want to learn more about dental bonding, or any of our other dental restorative procedures, please feel free to Contact Us Snellville Family Dental and schedule a consultation with Us. Repair broken teeth with dental bonding. Free 2nd Opinions. Work with most insurances. Financing Available.